Wed., May 3, 2017, 4:12 p.m.
CALGARY – Sam Steel didn’t go into the 2016-17 season expecting to win the Western Hockey League scoring title. That’s exactly what happened and the 19-year-old forward was rewarded for his efforts on Monday by winning the Four Broncos Memorial Trophy as the WHL’s player of the year. Steel, from Sherwood Park, Alta., registered 50 goals and 131 points in 66 games in the regular season to win the Bob Clarke Trophy as the league’s top scorer. “When you get to play on a team as good as I did, you get some individual success, so I’m just happy to be a part of it,” said Steel, who was selected by the Anaheim Ducks in the first round, 30th overall, of the 2016 NHL Draft. 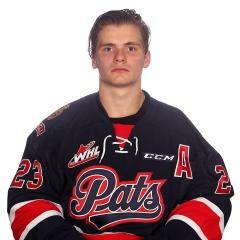 Steel and the Pats will take on Barzal and the Thunderbirds in the WHL final, which begins on Friday and Saturday with the first two games of the best-of-seven series in Regina. Pats general manager and coach John Paddock was named executive of the year and coach of the year for his part in Regina’s league-leading 112-point season. While Barzal finished as runner up to Steel, his Seattle teammate Ethan Bear was selected as the WHL’s top defenceman. “There’s a lot of great defencemen in this league and to be chosen, it feels really good and to be recognized for my hard work this season, it’s very special to me and my family and I’m very proud of myself,” said Bear, who has been out of the lineup since hurting his hand in Game 3 of Seattle’s third-round win over the Kelowna Rockets in six games. Bear is hoping to return to play for the Thunderbirds in the league final against the Pats. A pair of back-to-back winners were honoured as Carter Hart of the Everett Silvertips took home the goaltender of the year award for the second straight season, while Tyler Wong of the Lethbridge Hurricanes was named humanitarian of the year once again. Other awards went to Aleksi Heponiemi of the Swift Current Broncos as rookie of the year, Tyler Steenbergen of the Broncos as most sportsmanlike player and Brian King of the Silvertips as scholastic player of the year. The Victoria Royals were named the scholastic team of the year, the Pats won the WHL business award and Brett Iverson was chosen as top official. Published: May 3, 2017, 4:12 p.m.